The main ingredient in Tryptophan by Orthica is L-tryptophan, an amino acid that can be found in, among other things, milk, chocolate and banana. 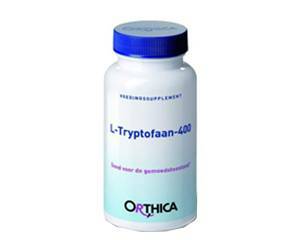 L-tryptophan plays an important role in promoting relaxation, restful sleep and positive mood. Therefore, L-tryptophan is often used as a nutritional supplement to help with anxiety and sleep disorders. Many people have some type of sleep disorder. Sleep disorders include difficulty falling asleep (insomnia), difficulty staying asleep (disturbed sleep) or waking up too early. L-tryptophan can reduce these problems. L-tryptophan is the building block for serotonin and melatonin. Melatonin plays a role in our circadian rhythms, also known as our natural sleep-wake cycles, and helps to prevent or reduce problems with sleeping. One capsule of Orthica Tryptophan contains 400 mg L-tryptophan and 10 mg Vitamin B6. Tryptophan is a hypo-allergenic product and does not contain yeast, sugar or lactose. For more information about the ingredients, see the package leaflet. L-tryptophan does not only improve the quality of sleep, it also enhances mood and stress tolerance. In addition, as the building block for serotonin, it is an effective appetite suppressant and supports smoking cessation. Take one to two capsules a day with some water or juice. People with difficulty swallowing can open the capsules and disperse the contents in a spoonful of water. Orthica Tryptophan works best on an empty stomach: 30 minutes before bedtime or eating is the best way to get the most benefit from this nutritional supplement. L-tryptophan can be used safely for prolonged periods of time. L-tryptophan may cause dizziness and blurred vision. L-tryptophan should not be combined with antidepressants or MAO inhibitors. L-tryptophan should not be used during pregnancy and while breastfeeding.